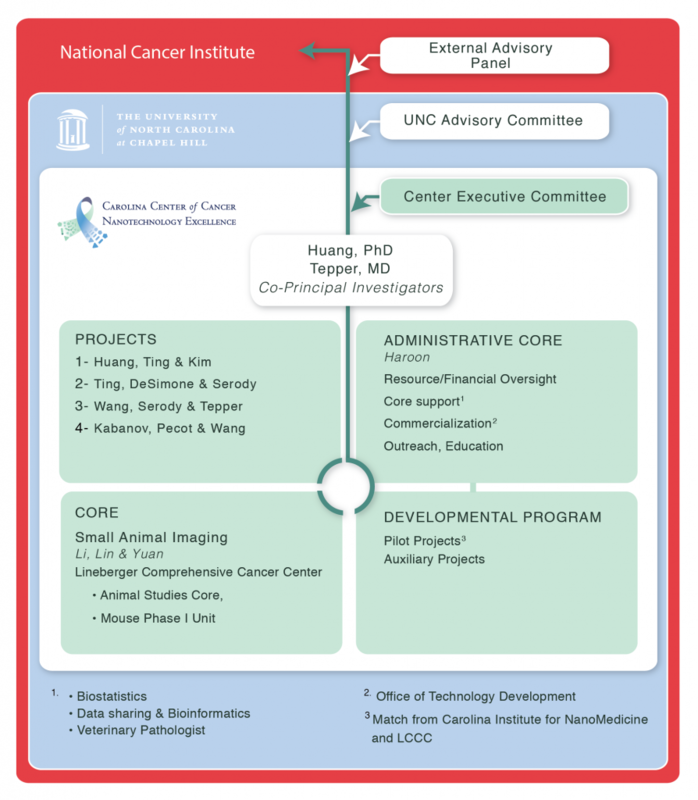 The Carolina Center of Cancer Nanotechnology Excellence is an NCI-funded multidisciplinary collaboration among a range of disciplines including departments of Pharmacy, Radiation Oncology, Chemistry, Genetics, Radiology, Hematology/Oncology, Microbiology & Immunology and Lineberger Comprehensive Cancer Center. Host response targeting of both immune and stromal components, represents a game changing opportunity to overcome cancer through the body’s built in defense mechanisms. The focus of Carolina CCNE is to exploit the host response through nano approaches for cancer disease management and treatment. We propose developing targeted methods for the delivery of biologics and, immunologic- modifiers and chemotherapies against melanoma and non-small cell lung cancers (NSCLC), utilizing innovative nanotechnologies developed here at UNC-Chapel Hill. Carolina CCNE consists of 4 projects. The projects revolve around the central theme of exploiting the host response against tumors with an emphasis on the immune response. Project 1 is the designated basic science project since novel polymetformin nanoparticles are being proposed for more efficient and effective delivery of siRNA, which is a critical challenge for drug delivery. The project targets Vemurafenib resistant melanoma, and emphasizes direct suppression of drug resistance that is coupled with a new vaccine approach. Project 2 evaluates ways to enhance the anti-tumor immune response through novel delivery of antigens via Particle Replication in Non-wetting Templates (PRINT®) nanoparticles. Unique adjuvants, such as Pathogen-associated Molecular Patterns, are being explored as well as the active suppression of blockers of host immunity in melanoma. Project 3 takes advantage of the biology of antigen release and the abscopal effect post irradiation through specifically designed nanoparticles to enhance antigen capture and the immune response to both primary tumors and metastases in melanoma. Project 4 uses polymeric micelles with high capacity loading to deliver therapeutics targeted to the tumor microenvironment as well as tumor cells in NSCLC. In summary, our Carolina CCNE is focused on improving cancer disease control and management to enhance treatment options for patients by the use of novel nanoparticles used in innovative ways that should have impact far beyond the specific disease conditions that are being studied.